Catulo Tango Show is a very traditional show with a local audience where stands out Tango to floor, which is the most classical style with a very good orchestra and very good singers, it also offers a tribute to Evita well interpreted and taking it out of the Music Hall’s cliché to insert this lady in her time and in the Golden Age of Tango. 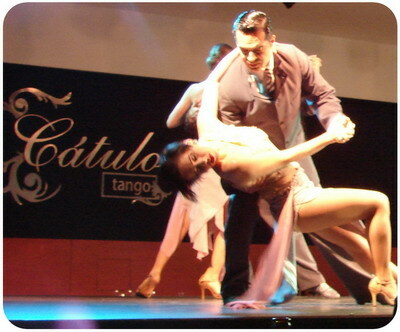 In a well-known tango neighborhood is Catulo Tango Show, one of the most chosen by locals where a traditional Tango style is danced as also stage Tango. 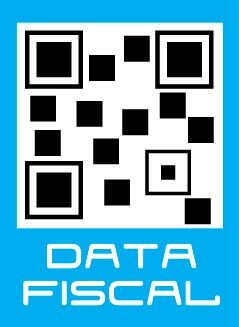 Catulo Tango Show has a very versatile body of dancers who can easy dance both Tango styles. Catulo Tango Show also accounts with an orchestra of seven musicians and a couple of singers both of them recognized in Tango world. One of the main characteristics of Catulo Tango Show is the good sight of the stage, besides being elevated, is surrounded by tables and the orchestra is on another platform, which means that the visibility is optimal. Catulo Tango Show incorporates a tribute to Evita that although takes musical notes from the Music Hall it quickly departs from the visual and the orchestra to the path of the local flavor incorporating a brushstroke of the Golden Age of Tango and the times of Peronism. The orchestra shines for its great sound, they are musicians who perfectly understand to each other and can set variations in order to tribute to different orchestras even in the same song. About the piano player we can’t say nothing less than he is magical. Also the female singer deserves a special mention by her fluent interpretation and the color of her voice. Catulo Tango Show also has that familiar and friendly touch, it is the only Tango show where the origin of the audience is asked, being from a neighborhood of the city or from another continent everyone is welcome and there are also greeting for birthdays and that is also a reason why it is chosen for celebrations of groups. The style of the room is consistent with this idea, Catulo Tango Show is more an event room than a show with a set design. This decision allows it to arrange, as we said, a central and elevated stage and to focus on the Tango dance. Within the menu options we recommend the spinach crepes, the chorizo steak and the creme brulee as a dessert. 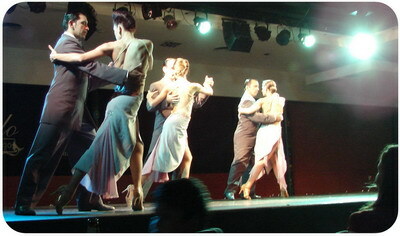 Catulo Tango Show, the traditional Tango in the center of the Abasto.